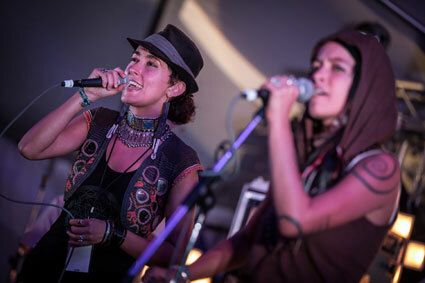 Sisters Leah Song and Chloe Smith lead Rising Appalachia, a renowned folk/world music group whose music is as intriguing as it is hard to classify. Their eighth album, Wider Circles, has just been released, and the group (also featuring percussionist Biko Cassini and bassist/guitarist David Brown) appeared onstage in their current hometown at Asheville, North Carolina’s New Mountain Theatre (Amphitheatre Stage) on June 13. The sisters’ parents both have strong roots in the arts. The idioms in which they work differ somewhat from what Rising Appalachia does, but there is a common thread running through all of it. “We have one of those family dynamics that is really treasured,” observes Leah. “And it’s pretty rare. We were raised in a very modest, lower-middle-class, hard working family. We went to public school, and we played on all of the community sports teams.” But she says that there was always a strong foundation in art and culture. Leah characterizes her parents as “big jazz record-playing, NPR-listening people.” That common thread of the family’s everyday life was part of shared meals, discussions and debates. “Holidays weren’t necessarily built around ‘stuff.’” The focus was, she says, more about sharing the product of some or other creative expression. “Our mom is a folk fiddler; our father is as well,” Leah notes. “And they both have been playing in contra dance bands and old time jam circles since we were babies. There was music in our house five days a week. And then on weekends, we’d attend a lot of old time folk studies; we’d go to fiddle camps; contra dances. We were very, very much musical. My mom started a sort of gospel/Appalachian/jazz singing group, a 12-woman project. 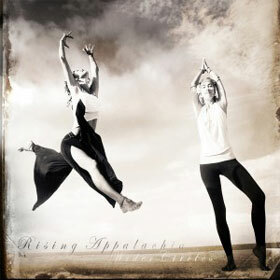 They rehearsed at our house.” So in many ways, Rising Appalachia was predestined, an extension of the family tradition. Leah and Chloe were going to do something. They certainly weren’t going to grow up and go off to law school, now, were they?